This is hands-down the BEST slow cooker sweet potato chili recipe. Keep it simple and vegetarian, with only the beans and sweet potatoes, or add ground beef if you want a little extra heartiness! Everyone raves about this recipe and I’m so happy to make it often because it’s a snap to toss all the ingredients into my crock pot and let it cook away all day. Leftovers just get better and better! Combine all ingredients in the base of your slow cooker (including raw ground beef, if using) and stir to mix well. Cook on low for 8 to 10 hours. Yumm…sweet potatoes in chili sounds like a delicious idea! They must make an already filling dish even more satisfying! I had planned on putting sweet potatoes in my chili over the weekend! However, I didn’t make it to the store before then and I was completely out! Oh my gosh, I want to make this meal this wkend!! I adore sweet potatoes, and eat one at a least 5 days a week. Uh oh, just realized something- can you make this recipe withOUT a slowcooker……? I got too distracted by the ingredients list and photos;-). Yum! I made chili this weekend too (2 batches!) but sadly I don’t have a slow cooker – yet – so mine were on the stove. However… I’m making a trip to my favourite kitchen supply outlet this weekend so I might just have to christen a new slow cooker with this recipe! This is why I need a slow cooker. Good lord. Hooray! The sweet potato chili recipe you had hinted at previously! Thanks, Andie. Looks like a winner! I’m wondering the same thing. Are we supposed to brown the meat first? Yes. I would like to know that too! cant wait to try this! Heavenly! AND I’ve been looking for an excuse to make jalapeno cheese cornbread…thanks for giving me one! Oh this dish just makes me want to curl up by a fire! This is so perfect for fall and I love the addition of sweet potatoes! Oooh, sweet potatoes! That sounds nice. I confess, I greatly dislike chili but I’ve been trying to find a way to make it myself so I enjoy it. I think it goes back to my mom’s chili being flavorless but full of kidney beans and celery. Yikes. OH YUM. This looks delicious! Can’t wait for a cool day to try it out. brilliant! making this over the weekend. I can’t wait to try this over the weekend. Philadelphia is nice and crisp right now, so it should be a perfect fall meal. I wonder if substituting the optional ground beef sirloin with ground turkey would taste as good? 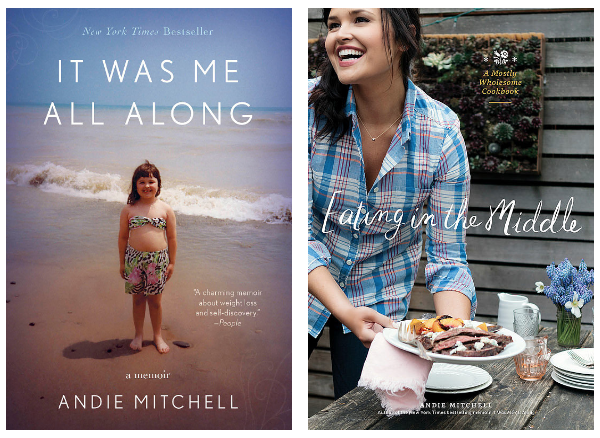 Andie, I’ve been quietly stalking your blog for some time, but this time I can’t resist posting. This stew looks uh-may-zing and I can’t wait to try it in the near future. The fact that it’s a crock pot recipe is just a bonus! Yuuuuuuum! Sweet potato chili is one of my favorites. And I can’t WAIT to bring out the slow cooker again soon! This looks so good and I love that it is made in a slow cooker! I loooove the sweet potato. 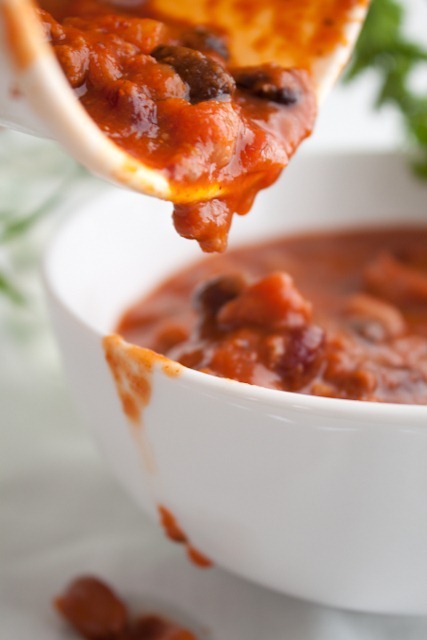 It’s a great little fall addition to a basic chili recipe! Delicious! I’ll be trying this out soon. I love chili and this looks like awesome comfort food. Pingback: Tried and True Tender Cornbread | Can You Stay For Dinner? I have this in my crock pot right now – I subbed turkey for the beef. The house smells delicious, I can’t wait for it to be done! Mmmmm. I’ve been using and abusing pumpkin for the last month and a half… I think this resipe may be my graduating dish to my new ingredient obsession: sweet potato? Loveeee. I swear that I know how to spell recipe. 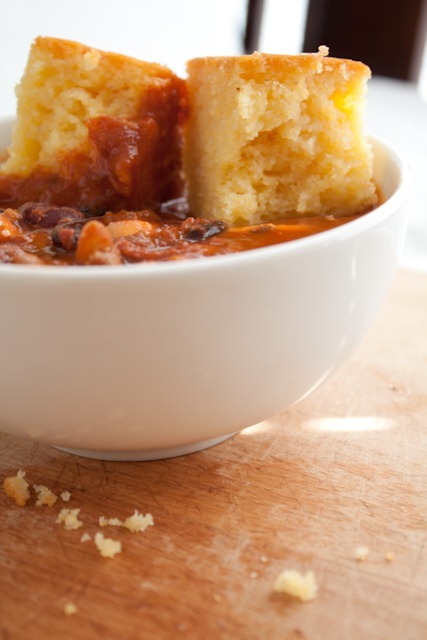 This chili looks awesome and the corn bread looks super yummy! Excited to try this now that there’s cool fall weather. Its in my slow cooker now! It smells so good. Im so excited to try it. made this tonight for dinner and it was awesome. got the high five from the kids and hubby. thanks. Just the kind of delicious comfort food I want in this cold and windy weather! Mmmm…made this yesterday. I wanted to serve this over mac noodles, but didn’t want the extra empty calories, so after it finished cooking, I threw in a handful of barley, went on a run, and when I came back, it was perfect! I topped it with (vegan) chorizo…soooo good. Thanks for the great recipe. I made this last night with ground turkey, and it was perfect! So happy I have lots of leftovers for dinner tonight :) Thanks! There are three awesome things about this recipe; chilli, sweet potatoes, made in a slow cooker. I’ll be making this very soon. Love, love, love the chili. Made it for company today and it turned out fabulous! So question, is this spicy? I want to make it so bad but I am a bit of a spice baby, meaning a little tiny bit of spicy-ness is great, but too much and I die. Anyone, is this chili pretty spicy? This is a great recipe, thank you for sharing it! I love making chili, but have never added sweet potatoes to chili. This is something new to try. First snow day today, in Denver, Colorado. Just came home to your sweet potato chili, smelling up my house so wonderfully!! I am going to make some corn bread now and hope I can control myself until it is down. Wonderful recipe. Thanks!! I didn’t know how I would feel about this chili since I decided to not put meat in it (I am an avid carnivore). I’ve had this in my crockpot for 4.5 hours. . .I couldn’t resist trying a bite. 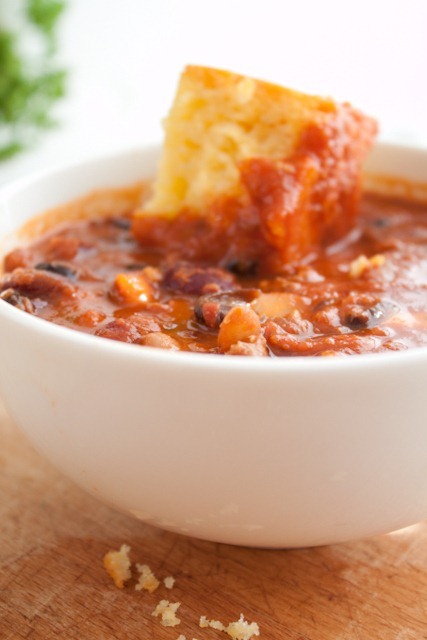 It reminds me of a “light and fluffy” version of chili; love the smokey paprika flavor too. I used 1.5 tablespoons of chili powder and 1/2 tablespoon of Mexican hot chili powder to give it a little of a kick. Can’t wait until it’s done!! Thanks for sharing! I just made this for my work chili cook-off and it was a hit! I combined the sweet potato idea with my usual recipe and got lots of positive feedback. Thanks for the inspiration! Quick q: do you have any nutritional info for the chili? I made it on Sunday and it is soo good, just want to know how much to eat at a time. :) thanks! My friend just turned me on this this website and I love it. I never cooked before until 5 days ago and I already made 3 recipes from your site and they are all delicious and fun to make! I wanted to make the sweet potato chili tonight but have everything except cumin. How will the chili come out with out it? Should I add more of something else? Does anyone know the serving size for this recipe?? I am on WW and plugged it into the recipe builder on etools to find out the pointsplus value and would like to know the serving size. Any help would be great!! Hi there. Just wondering, do you rinse the beans first? This looks sooo good. For those that have tried it, did you end up browning the meet or not? Thanks! I do not rinse the beef first. In fact, I never rinse any of my meats. And I do not brown the meat first. Hi Andie sorry I mean the beans? Do you rinse them? I know I also misspelled meat, how sad…LOL! Yes, I rinse the beans and drain them before adding to the pot. Made your chili today. Amazing will be eating leftovers for lunch this week. Topped with a little goat cheese and served with corn bread. Wouldn’t change a thing. So simple to make. Thanks for sharing. This looks delicious! I’ve never heard of using sweet potatoes in chili but it sure sounds interesting. I’m going to try this over the weekend. I have never liked chili before but the rest of the family does so I make it occasionally for them. This smelled so good I had to try it and LOVED it! I think it’s the combination of the sweet potatoes and the cumin. It’s delicious. I did the nutritional info for it and was very pleased with the calorie/fibre/protein numbers too. A friend made this without meat and it was SO good! I’m planning to make it next week – if I sub ground turkey meat for the sirloin, do you know how many WW points that will end up being for a serving? Hi! I’m making this right now and realized it needs to cook on low for 10 hours…I don’t have that much time. Can I cook it on high? How many hours? I made this using ground turkey. Thanks for the yummy recipe. My husband, who always complains he does not like sweet potatoes, loved it! does anyone know if we drain the beans beforehand? I’m going to make this during my lunch hour so I will not be able to do the low setting for 10 hours. Do you think 5 hours on HIGH in the crockpot would alternatively work just fine? Yes I think that would be just fine! Do you think I can get away with cooking it for only 6 hours? That’s all the time I’ve got left. :) Also, do you think it would ruin it if I don’t add the brown sugar? Yes, I think 6 hours is fine! The brown sugar does add a nice sweetness, but if you feel like omitting it, I’m sure it will still taste great! Pingback: Fall Favorite Recipes | Can You Stay For Dinner? Rise even ground beef? I have never even considered thst. I made this over the weekend. We couldn’t eat as it was too acidic. How do I tone done the tomatoes? Oh no! I haven’t had that problem, but I’m really sorry to hear that you had poor experience, Brenda! To tone down the acidity: increase the amount of brown sugar. Add 3 additional tablespoons, stir well, and then taste and adjust as needed. Has anyone made a double batch and frozen half? I was wondering how it would taste after thawed and reheated. Made it today… Was wonderful! Pingback: Putting My Mom on a Diet: Week 18 Meal Plan and Weigh-In | Can You Stay For Dinner? Hey Sara! It should come out to a cup and a half per serving. thanks andie! i’m going to try this recipe this weekend. my parents are coming over to help my husband and i take down 3 layers of wall paper in our new home (the previous owners clearly didn’t take anything down before putting up a new layer) and we’re going to need a hearty home cooked meal after a hard days work!! Andie, can this sweet potato chili be freezed? If so, how long do you think it would be good in freezer? I like chili with a little spice, could I add some heat with chipotle peppers or something, do you think that would work with the sweet tater? Thanks. Oh man that looks good, that’s going on next week’s menu! To quote my hubby, “This may be the best chili you have ever made!” I made just a few modifications: I used almost 2 lbs of ground beef and so I added more sweet potato, doubled the amount of chili powder and cumin, added a bit more smoked paprika, but kept everything else the same. SO YUM!!! When I served it, I stirred into the PIPING HOT chili some shredded jack cheese. Wow, with an ice cold beer – perfection! I’ve made this about five times on the stove and I love it. I have frozen it and it thaws out just fine. It still tastes fresh. I want to make a freezer meal for a friend who just had a baby and I get out of work at 10:30 tonight and I go back in tomorrow from 8-4:30. I’m already on the schedule to bring something tomorrow night. Can I cook the sweet potatoes tonight in the microwave and add them to the rest of the room temperature ingredients? I could dish it out in individual servings and put it in freezer bags. Then I could freeze it tonight and put it in the freezer at work tomorrow until I deliver it. Would that work? Or should i put it in the crockpot overnight? Wondering if this would freeze well? Anyone ever frozen uncooked sweet potato? Just made this tonight, it was sooo yummy!! I’ll be making this again for the rest of my family. Hi Andie, can this be made with already cooked plain chopped sweet potatoes? I have leftovers from a work potluck. How long would you cook this in the crockpot then since you are just heating everything? Would you add the potatoes in at the beginning or towards the end? Hi Amberly! Yes, you can use already cooked ones but they’ll turn really, really soft–and maybe a little mushy, maybe if you put them in at the beginning so I’d put them in toward the end—-for the last hour of cooking. I’d say cook the chili for a total of 4 hours on low!